Mentorship and guidance by teams of caring adults who know each student well. 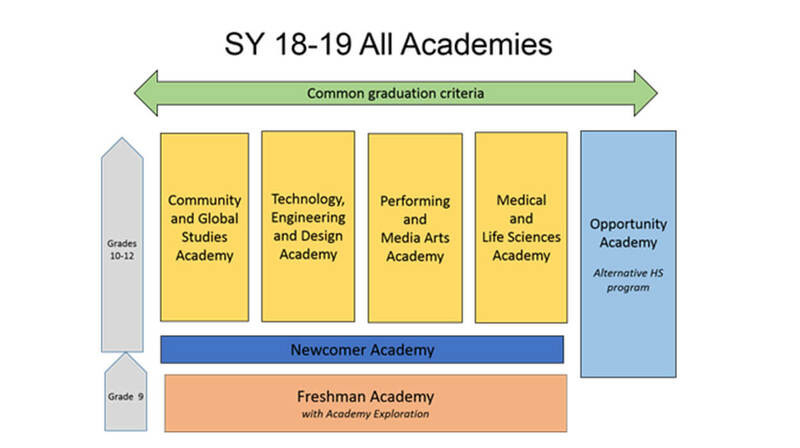 The Freshman Academy also supports the exploration of and transition to the theme-based academies for grades 10-12. Students who have recently entered the school system for the first time with limited English proficiency may join the Newcomers Academy for up to one year. In this academy, students will continue to progress in Spanish in most core academic courses. Expert instruction in language development speeds the growth of English skills and academic learning simultaneously. This is a small, specialized academy; the size of the academy will fluctuate based on the number of students who qualify. In this past year, 40 students (36 from Holyoke High, 4 from Dean) would have benefited from belonging to a Newcomers Academy. The Newcomers Academy is, by design, a short-term support for students new to the English language. Most students who are learning English, including those who have gone through Newcomers Academy, will choose a theme-based academy and pursue a personalized path with support from ESL teachers, just as students with disabilities will pursue pathways within academies with support from special education teachers.